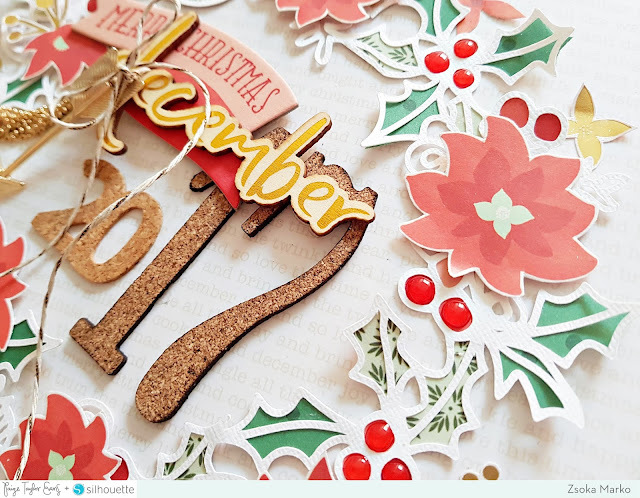 After sharing the first bunch of filler pages for my December Daily album, I'm back today showing you my DD album cover! Since I love wreaths, I wanted to create one on the cover and Paige was kind enough to listen to my wish! I've used the Holly Wreath cut file (Silhouette ID: 230976). Isn't it just fabulous? I picked one of my favorite Christmas collections (in traditional colours anyway! ), Christmas on Market Street from My Mind's Eye. I'm quite bummed that I hardly have any papers left :(. 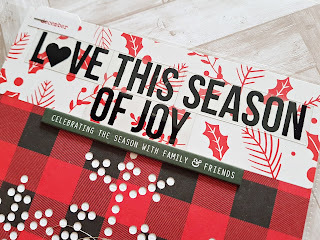 I sized down the cut file to fit onto my cover, then started backing the holly berries and leaves. I fussy cut some poinsettias from one of the 12x12 papers, as well as some smaller flowers. I then glued down my cut file in the middle of my cover. Apropos glue...The topic is driving me insane. I've tried soooo many types of glue. Glue that some folks state can hold floor boards in place. NOTHING works on slick surfaces for me. So typically I can't glue anything onto a page protector, I can't glue any small metal embellies or sequins onto my layouts. Yeah sequins stay on with glue dots but if I wanted to I could totally remove them. Anyway back to topic. I used tacky glue to glue the cut file to the cover. Once it dried, I could peel it off without damaging anything. With ease. The horror! Then I used glossy accents and now I don't dare to touch that thing! I chose some big cork numbers from my stash and some small ones from this year's Ali Edwards December Daily main kit to create the year. 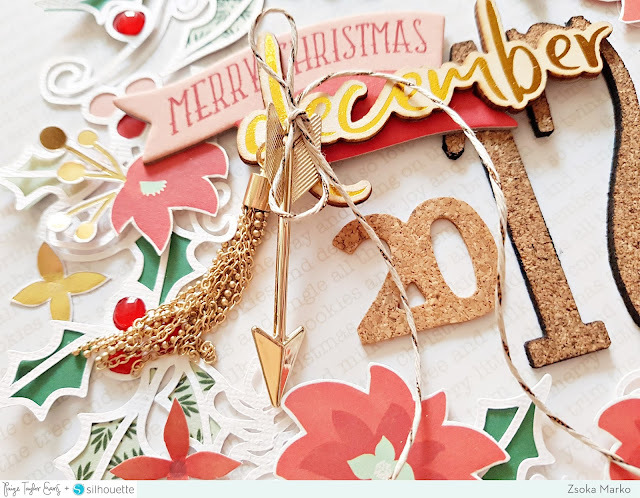 I picked a couple more embellishments for the center, a chipboard banner from the MME Christmas on Market Street collection, a gold foiled wood veneer from the Pinkfresh Studio December Days, a tassel and an arrow I found at Michael's earlier this year. I glued everything down and added the little charms with a piece of twine. As a last step, I added some Nuvo Jewel Drops to the holly berries. I'm obsessed with any kind of drops but this one is my favorite! And done! This wasn't a complex project but I really like how it tuned out. Thanks for stopping by and have a great day you guys! 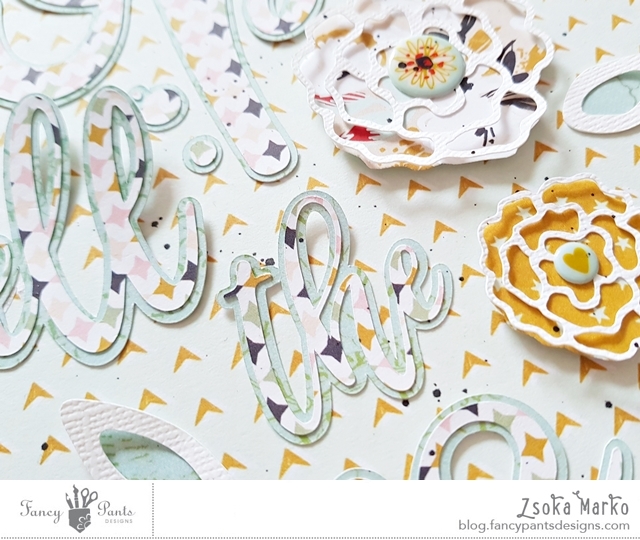 Zsoka here with you today sharing a new layout! It's November, the month of Thanksgiving in the States. We don't celebrate Thanksgiving here in Germany (or not that I know of anyway!) but that doesn't mean we are not thankful for many things :). For my layout however, I decided to document a lighter, easier moment I am grateful for. I am fascinated by my son's love of nature, animals and plants, all living creatures in this world! He knows so much about animals, I have no idea how he can remember all that information! Kids are amazing, aren't they?! His love of flowers he probably gets from me, because I always stop and adore them everywhere we go. He does the same. Smells each one! So I chose to create a layout dedicated to this - hence the title, Stop and smell the roses. 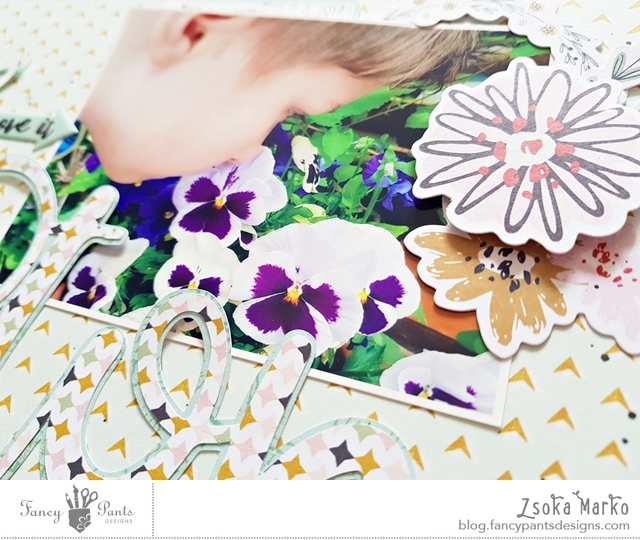 I worked with the beautiful Dream Big collection and chose a photo of Maxim admiring some pansies. I wasn't bothered by the photo not matching my title (ie roses)! 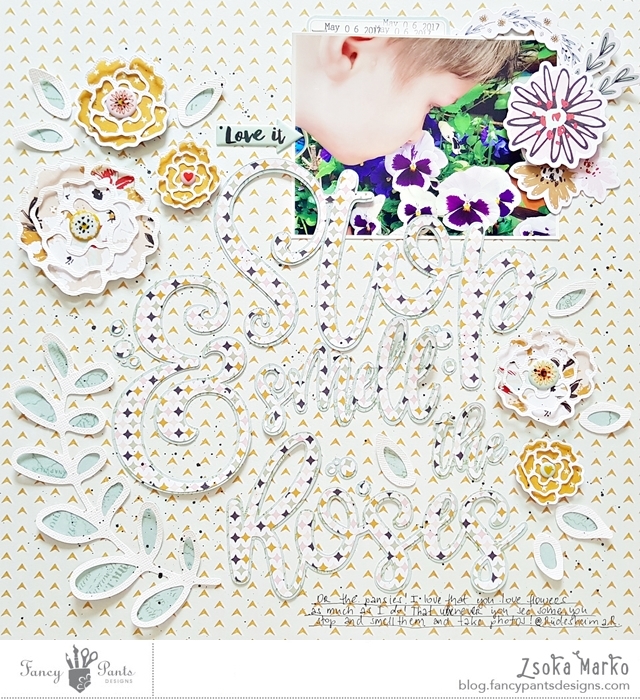 I found this gorgeous cut file in the Silhouette Design Store and couldn't wait to use it! 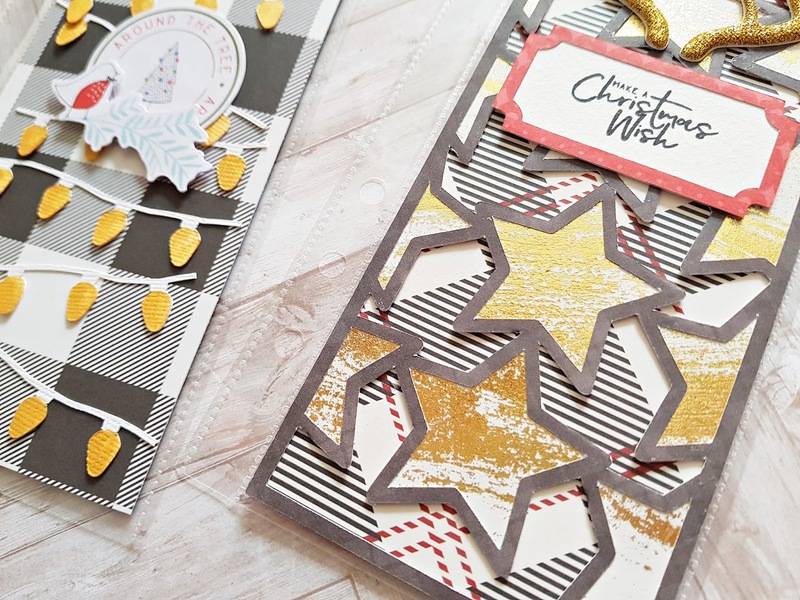 I first cut the file from a light patterned paper, then created an offset which I cut from a different patterned paper to give it a bit of definition. I wanted to create a monochromatic kind of look to let my color photo shine. I more often than not use black and white photos but when they are of flowers, I obviously want to keep the color! 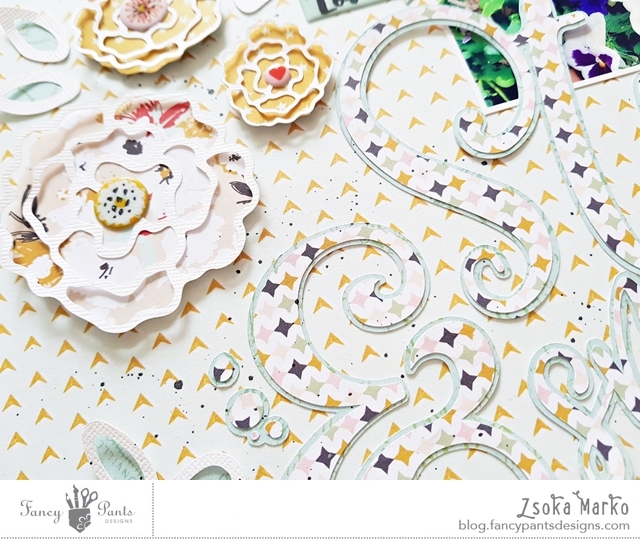 The flowers and leaves I cut from textured white card stock and backed them with different patterned papers. I did not glue down the outer edges so they are more airy and dimensional. I added some puffy stickers to the flower centers. I also didn't adhere the whole text to background only the bottom of each word. Again, to add dimension and create interest. 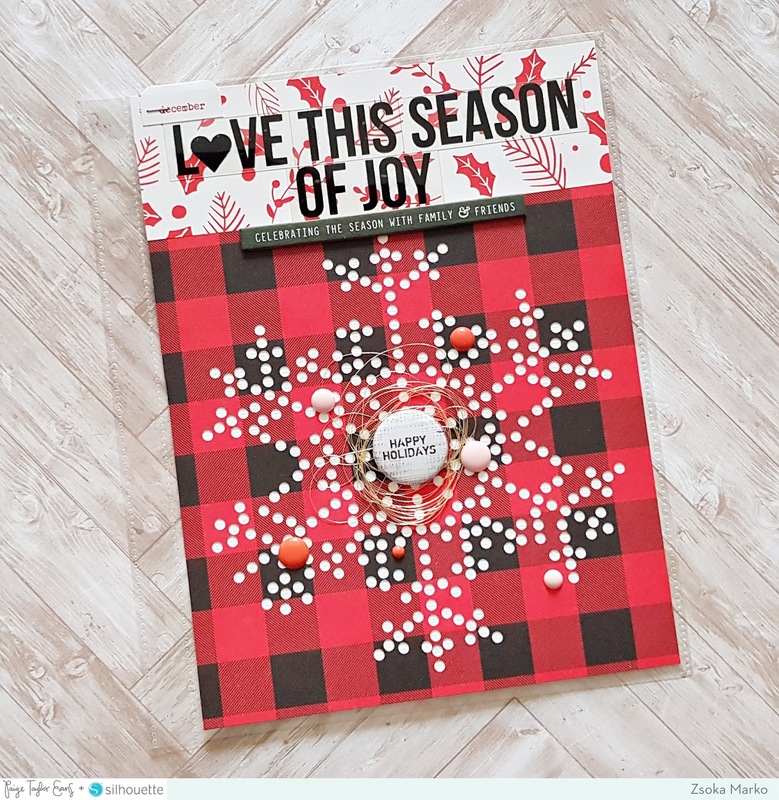 I didn't want to cover up any of the cut file, so I tucked my photo behind it at the top and only decorated around the photo using puffy stickers and die cuts! To finish off my layout I added my journaling, date and black ink splatters. Which was a bit of a funny story, because I was watching some series and something happened that I don't remember anymore, but I stopped splattering for a second and a big blob of black paint fell on to the middle of my layout! The horror haha! I had to tear off "smell" and cut it again in a bigger font so I could cover up most of the paint! You can still see it a bit at the letter M, but it's not too bad. So probably not a good idea watching anything while having paint in your hands, not that I learnt my lesson, ha! 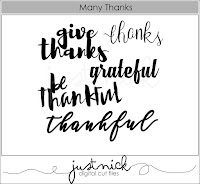 What are you guys thankful for this year?! This week we are focusing on Thanksgiving at Just Nick! 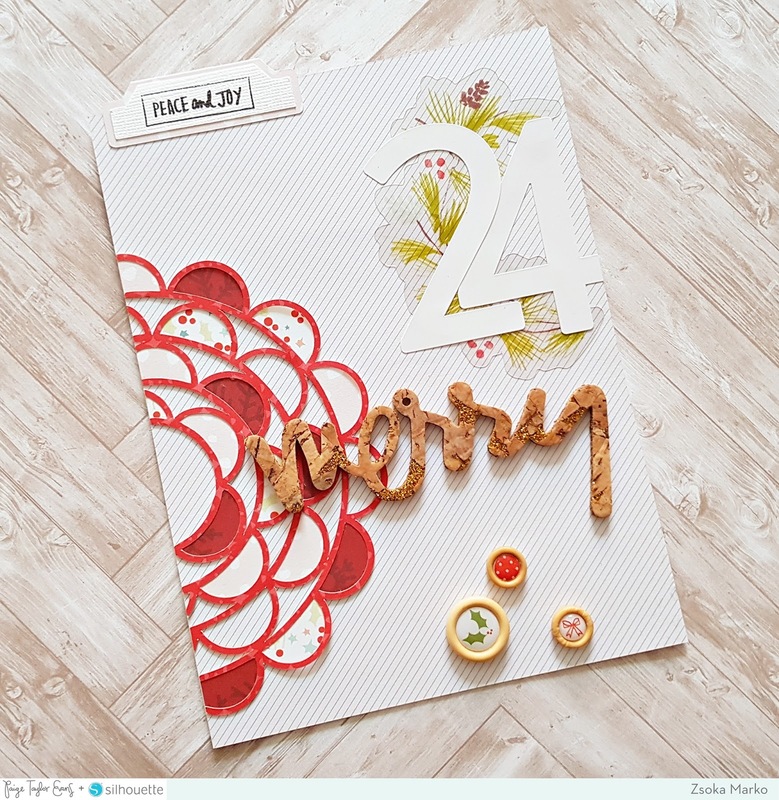 Since we do not celebrate it here in Europe, I thought I could create a bunch of Thank You cards instead of a layout! These always come in handy anyway right? 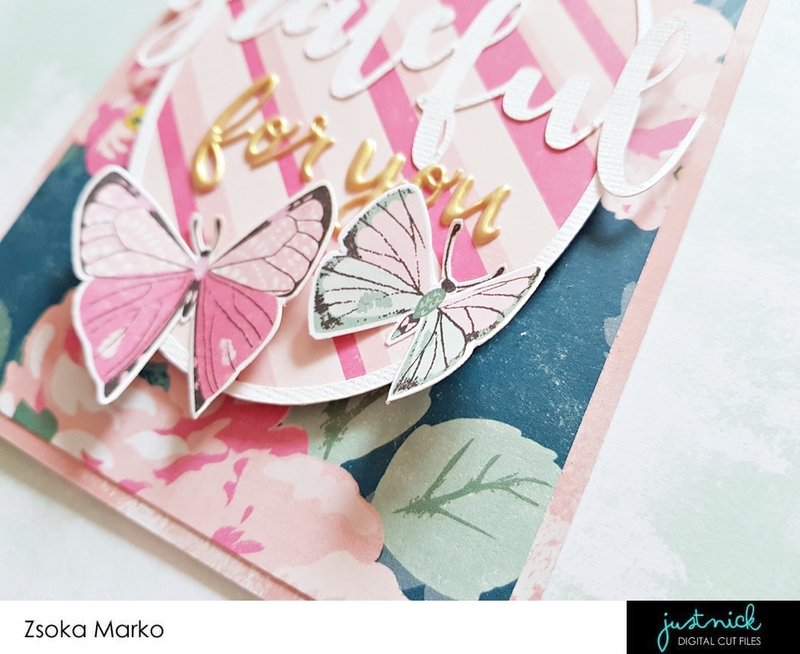 I selected a few cut files with this theme as well as some florals and butterflies, because well, I love them...When I was little my parents' botanist friend thought I'd become one too (botanist that is), I was so interested in flowers. I even got a book from her called Zsofi's garden - it was the most similar name to mine that she could find :). At some point I did want to become a florist, but in the end that did not happen. I cut out all shapes from textured white card stock. 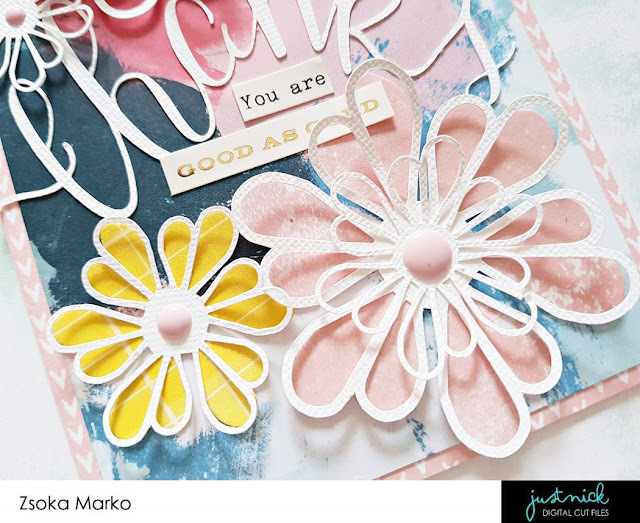 On my first card I backed the oval wreath with some patterned paper from the Maggie Holmes Chasing Dreams collection (all supplies I used for these cards are from this collection). I then added some foam to the back so it pops off the card. 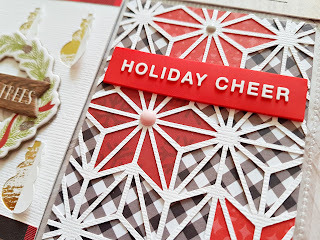 I created a 4x6" card base with two different patterned papers, then glued the wreath on top. 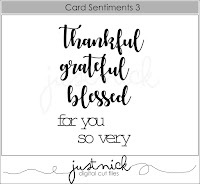 I added Grateful and completed my sentiment with For you using the gold puffy alpha stickers. I fussy cut two butterflies from one of the papers and glued them down on top of the wreath. I also used a third butterfly; this one is a chipboard piece. 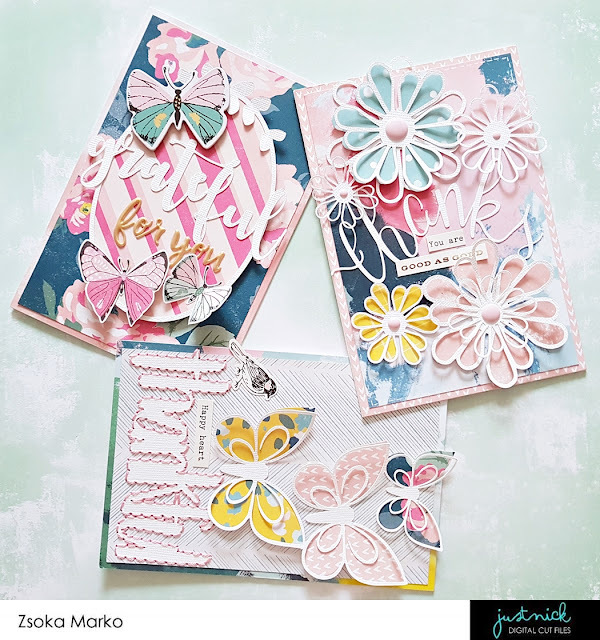 I created another 4x6" card base using patterned papers. 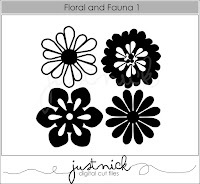 I backed a few of the flowers from the Floral and Fauna cut file set. Some I didn't back. I layered these on top of each other randomly, to give my card an airy feel. I glued Thanks in the middle of my card and completed the sentiment using stickers. As a finishing touch I added a few enamel dots. My third card design is also on a 4x6" base. 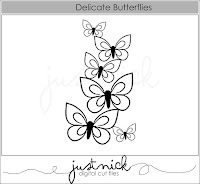 I cut part of the Delicate butterflies cut file and backed these with patterned paper. 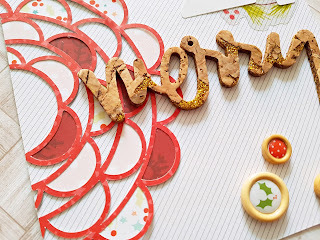 I glued Thankful at the bottom and hand stitched around the letters to give them more definition and texture. I added two stickers to finish off my card. That's it for today! I hope you like my cards! 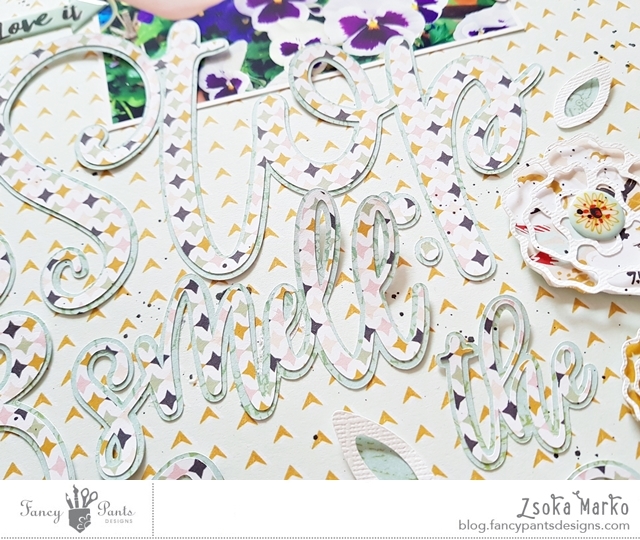 I'm back today with some new projects to share that I created for the Paige Evans + Silhouette Design Team. I'm sure many of you do December Daily and this year I decided to do one again too. I really loved the main kit and many extras from Ali Edwards so I felt inspired to work on my DD already. The cards/pages I created will not be in the same place in my album, I will mix them in with simpler designs. At least that's the plan! 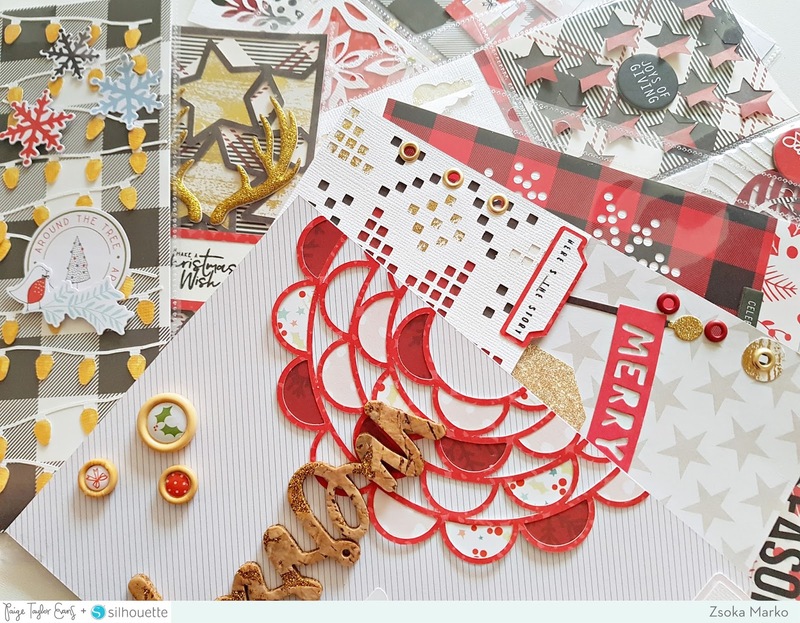 I will try to include a list of supplies but I've used so many different collections, lots of scraps from previous years, that I might miss a few. Without further ado, here's what I've done so far! I used a scrap piece of plaid paper to cut the Snowflake dots (ID #217965) design from, then attached it to a 6x8" white card stock. 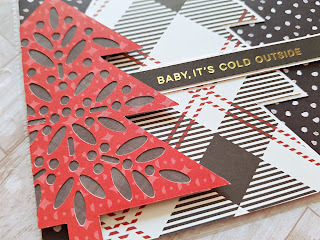 Since the plaid paper was smaller, I cut a piece of patterned paper from the Ali Edwards DD kit for the top bit. For the big title I cut apart a 3x4" acetate card, and also added a chipboard sentiment below it - both from the AE DD kit. 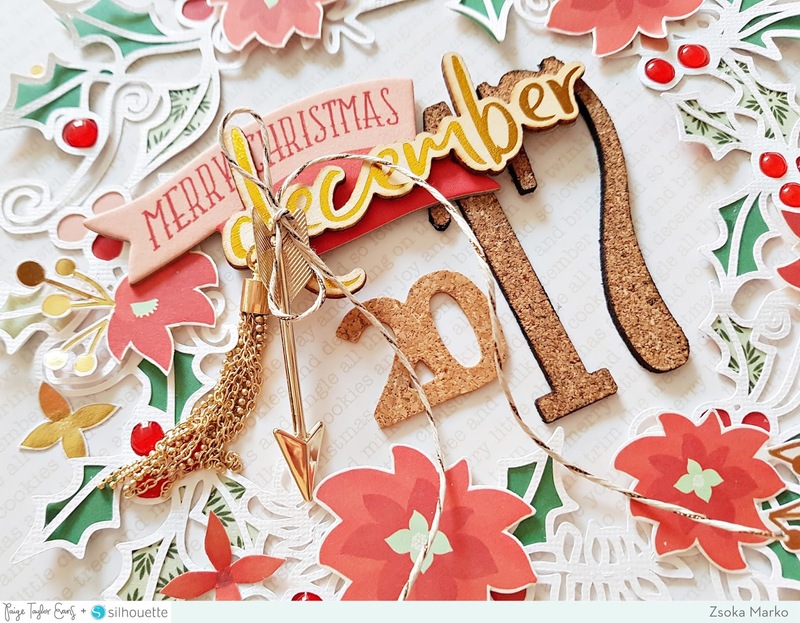 Just to add a bit more interest to my page, I adhered some metallic gold thread and a flair button (from A Flair for Buttons) in the middle of the snowflake and placed some enamel dots here and there (Pinkfresh Studio - December Days). One of my favorite pieces in the AE DD main kit this year is this pocket page! I can't wait to fill it with some random stuff that don't fit in the page protectors. 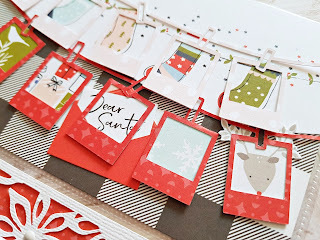 I also made some tags to write my stories on (I used Crate Paper Falala and Echo Park Paper Twas the Night Before Christmas for my tags as well as some AE and Studio Forty stamps). 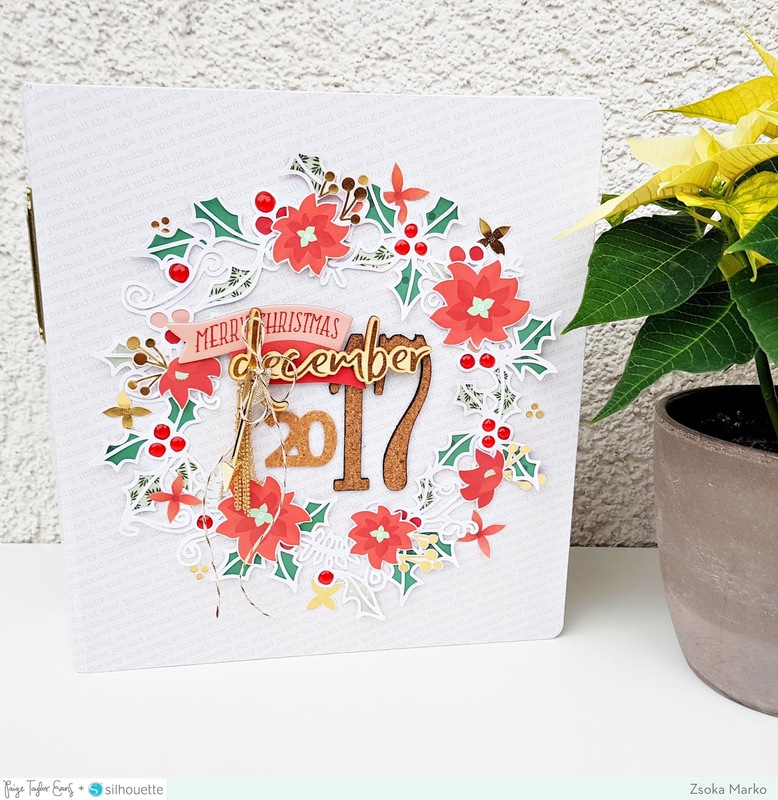 I used a part of the Poinsettia Nordic Background (ID #228022) cut file to create a 4x6" card that I glued on the front of the pocket. I cut the design from white textured card stock (Bazzill, always Bazzill!!!) and backed it with scraps of patterned papers (My Mind's Eye Comfort & Joy, Jen Hadfield). I created a cluster for the middle, consisting of a wood veneer and two chipboards, all from the AE DD kit. I used the Labels - Set of 3 (ID #216960) cut file to create a little tab, which I then stamped "Here's the story" on. Next up, the most important page in the book ha! We do the presents on Christmas Eve, so for us the 24th is Christmas. Now, I didn't add dates to most of these cards because I have no idea where in the album they will go. However this one I knew I'd use for the 24th so I attached some number stickers on top of an acetate shape (both from the AE DD kit). 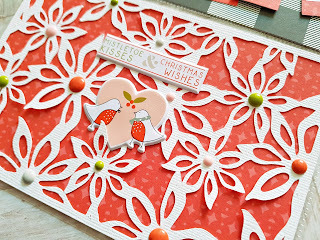 For the opposite side I cut half of the Scalloped Circles Background (ID #222606) from a red paper from the Paige Evans/Pink Paislee Turn the Page collection, then backed some of the scallops with papers from EP Twas the Night Before Christmas, Fancy Pants Merry & Bright and Pinkfresh Studio December Days. I added another favorite from the AE kit, the Merry cork piece. 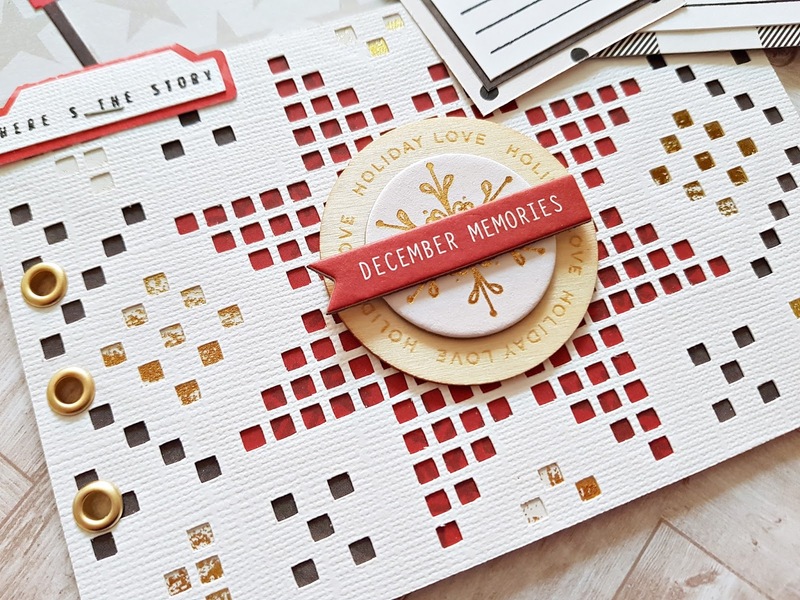 To finish off this page I adhered some wood buttons (PFS December Days) at the bottom and added another stamped label at the top (same Labels - Set of 3 (ID #216960) cut file as above). For the one on the left I cropped the Lightstrand Background cut file (ID #216750) to fit this size. I used textured white card stock and painted the bulbs gold with some Prima gold water color paint. 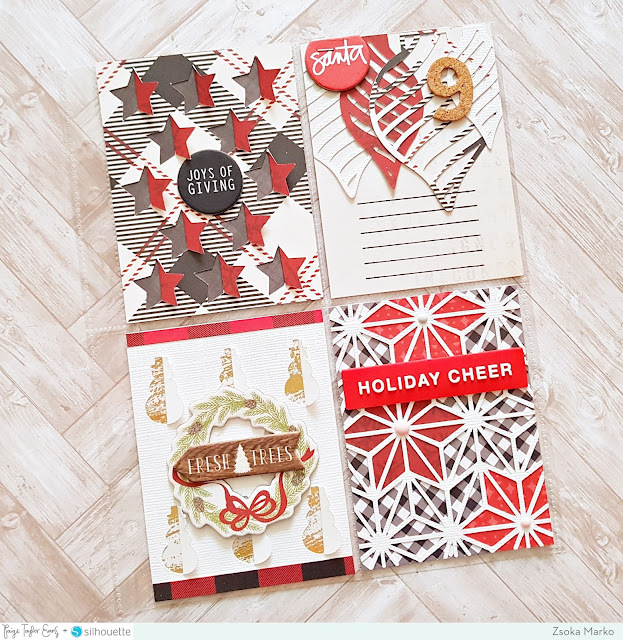 Not sure where the plaid paper is from, I have way too many...but the embellies are all from PFS December Days. The papers I used for the second one are from EP Twas the Night Before Christmas and Jen Hadfield. I cropped the Stars Background cut file (ID #225768) to fit this size, also added a border to it so that it is easier to attach it to the 3x8" paper behind it. For extra embellishments I chose some gold sparkle antlers from the MME Christmas on Market Street collection and a label die cut (Labels - Set of 3 (ID #216960). The stamp is from Pinkfresh Studio. Now coming to the next size, 4x6"...I've made 4 cards for now. For the one on the top I picked out the Polaroid Frame Border cut file (ID #228024). Isn't it the cutest thing?! Especially in this tiny size! I die! The red paper is from Paige Evans/Pink Paislee Turn the Page, the pink one is from PFS December Days. There's a cut apart paper in the PFS line and this one with the socks happened to fit perfectly! I love happy accidents like this. 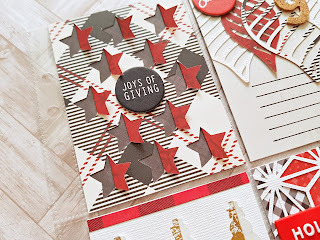 I backed the red die cut with little images from the same PFS cut apart sheet. Then I just placed both frame borders on a plaid paper and done! As for the bottom one. This was actually the very first one I made and even though I was not going to go with this color scheme, this card changed my mind. Red is my least favorite color but for Christmas I really don't mind using it, it should seem :). I sized down the Poinsettia Background cut file (ID #217962) and cropped out a 4x6" piece from it. 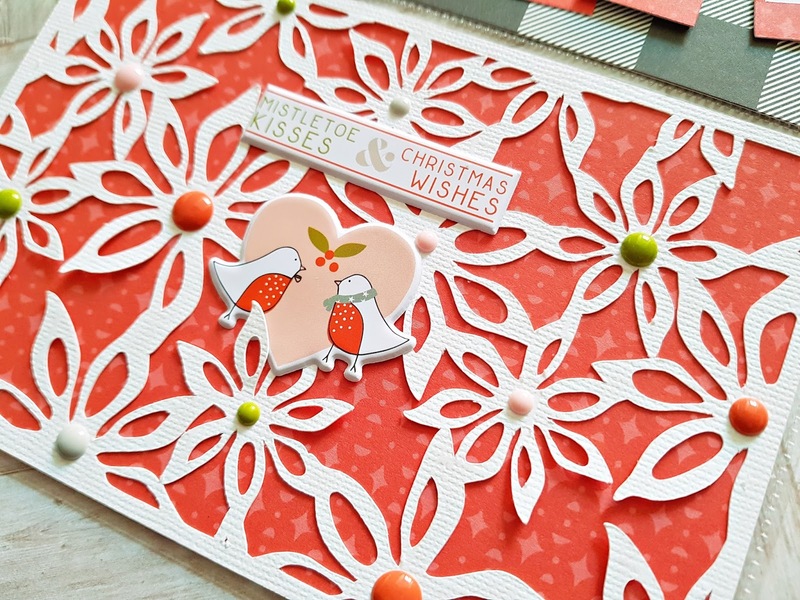 I adhered it to the red background (PE/PP Turn the Page) and for embellies I chose some enamel dots and puffy stickers from the PFS December Days collection. Next up, two more 4x6" cards. For both of these I used the Folk Art Christmas Trees cut file (ID #216729), for the one on top I took apart the tree and used only the middle part of the cut file. I repeated the same pattern on a 4x6" base. I cut this from textured white card stock and backed it with a red and black plaid patterned paper. Then to add more interest I also glued the negative pieces on top (they were too pretty to throw away!). 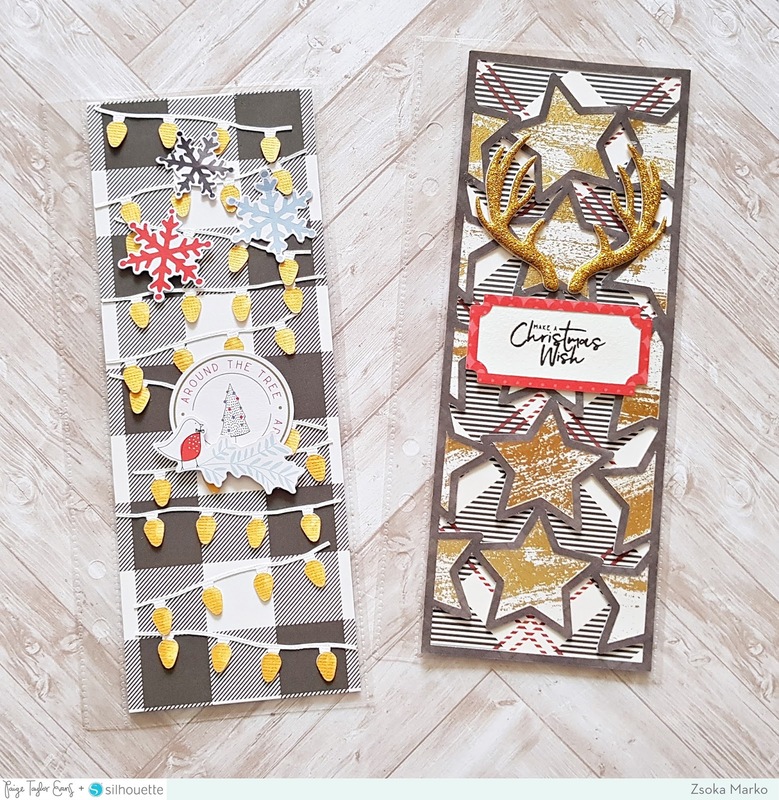 The chipboard elements are from MME Christmas on Market Street. A couple of black sequins and done! The card at the bottom is very simple. I cropped one of the christmas trees in the above mention cut file set for the red one and for the plaid one I only used the outline of the tree and I also cropped this at the top and bottom. 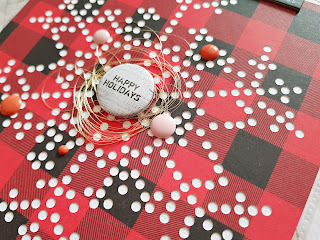 I glued down the plaid tree first, on a paper from a DD kit, then popped up the red tree using foam adhesive. I finished off this card by adding a simple sentiment sticker. Now come the smaller sizes, first 3x4"...I made 4 of these so far. I used different cut files on all of them. Let's start from top left. I chose the Cut and Fold Stars cut file (ID #219438). I made sure I used a patterned paper which I liked both sides of, especially together, since you will see both sides once you fold the half star to make a whole star. If that makes any sense! 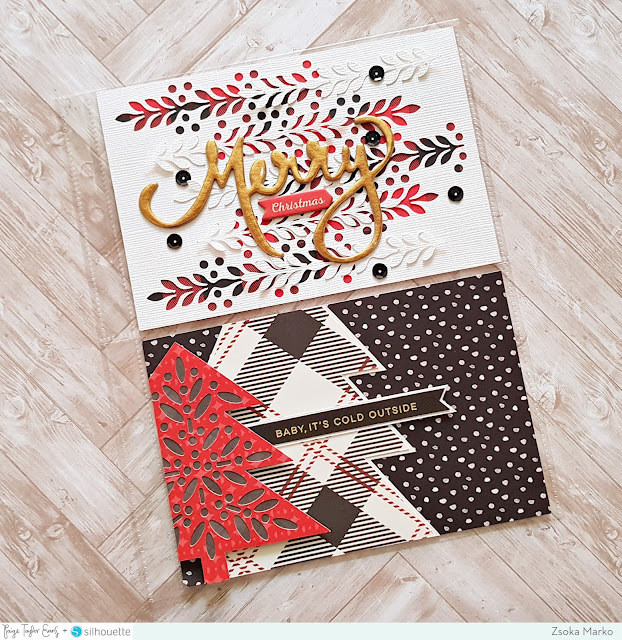 I backed this with a black plaid paper and only added a simple black chipboard from the AE DD kit to embellish this card, since I didn't want to cover up the background. For the card on the top right I cut a 3x4" base from a scrap piece of Crate Paper Falala paper. 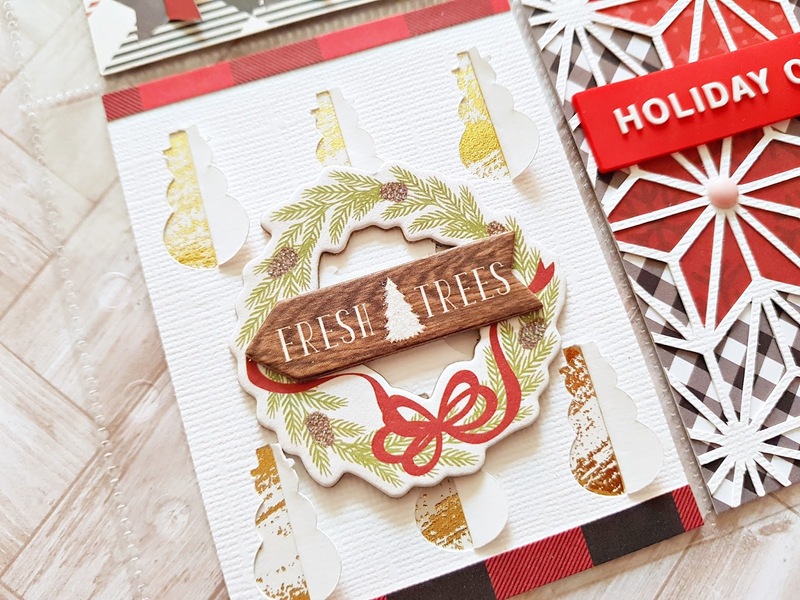 I cut the Ornaments Pair (ID #216756) from textured white card stock as well as some EP Twas the Night Before Christmas papers, all 4 in different sizes. Then I arranged them at the top and cropped them. 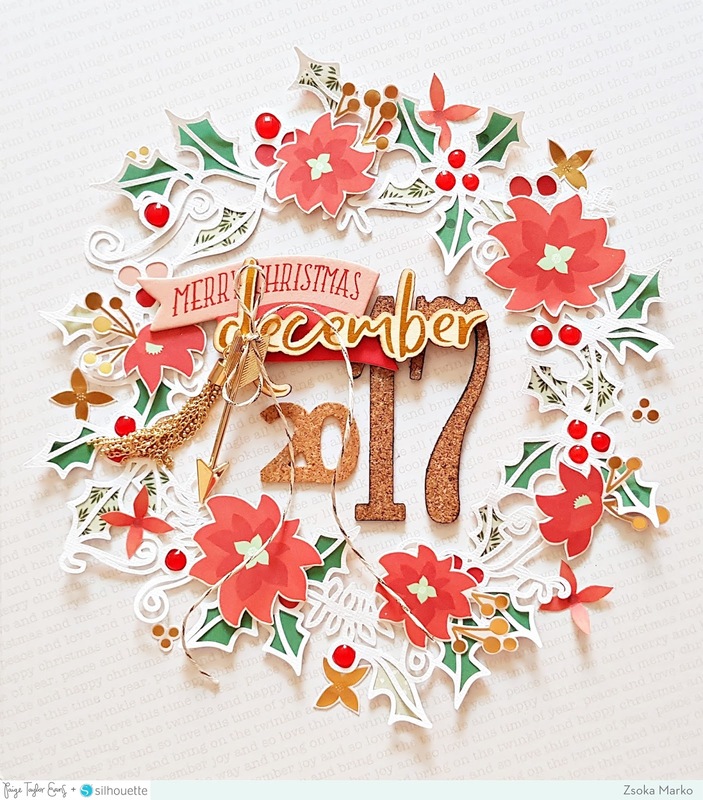 I attached a chipboard circle with my tiny attacher and adhered a cork number on top of the ornaments. Both of these embellies are from the AE DD kit. 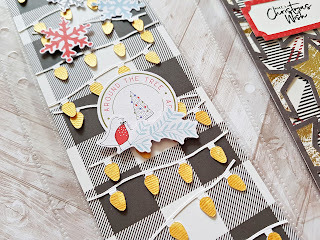 I stamped some lines using a Studio Forty stamp, because I know I surely will have something to say about December 9, since this is the day we celebrate Sinterklaas with our family in Holland. He brings presents to the kids on December 6 (the Dutch traditionally don't do presents at Christmas but at Sinterklaas), but since we can only go at the weekend, we celebrate on the 9th. Bottom left card is up next. I used another cut and fold design on this one, the Cut and Fold Snowmen (ID #216999). 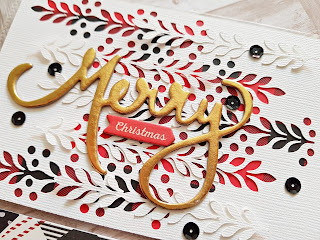 I cut this from textured white card stock and backed it with a gold wood grain look specialty paper from Jen Hadfield. For some pops of color I added a strip of plaid paper at the top as well as the bottom. 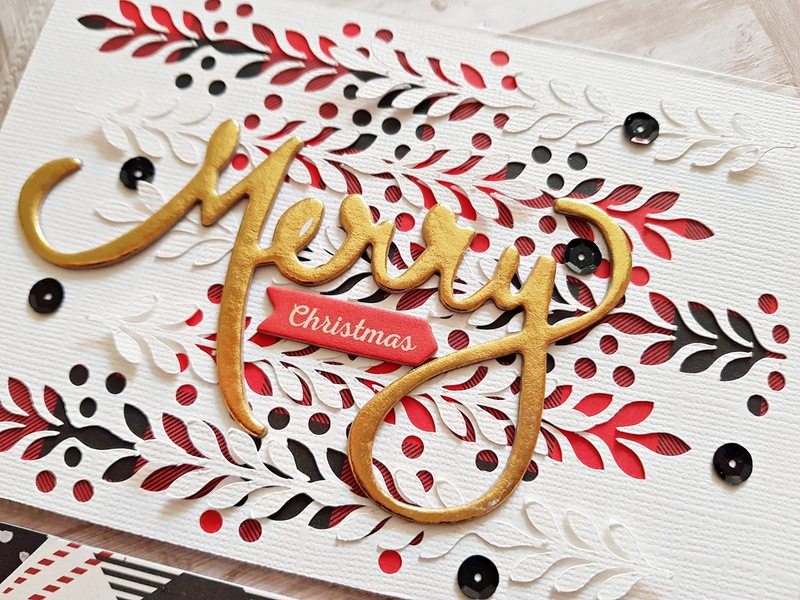 I picked two chipboard elements from the MME Comfort & Joy collection to decorate this card. Last but not least, the bottom right card. I think this is my favorite! 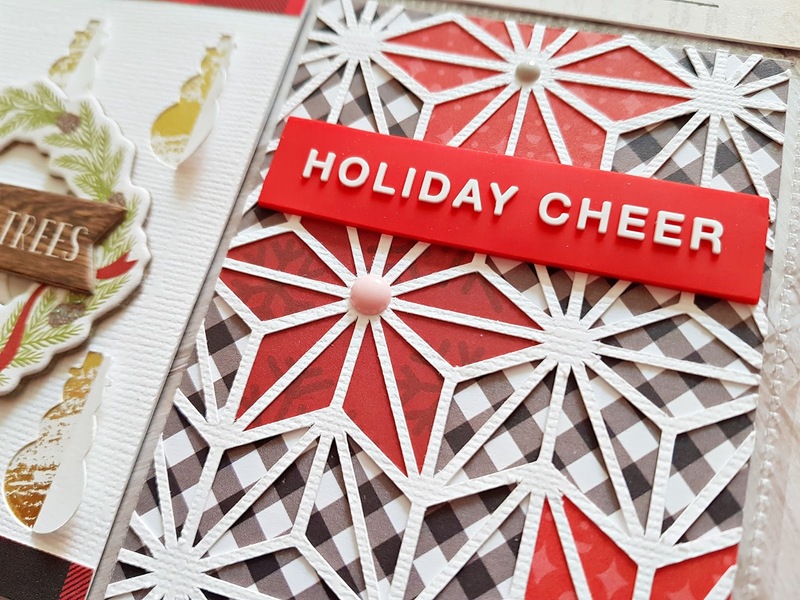 I used a 3x4" card (from one of the older DD kits I believe) for the base and layered the Geometric Stars Background (ID #227004) cut file on top of it. I simply cropped out a 3x4" piece from the cut file. To back the stars I used the red paper from PE/PP Turn the Page and a darker red one from EP Twas the Night Before Christmas. I glued some light pink enamel dots in the middle of the color stars. 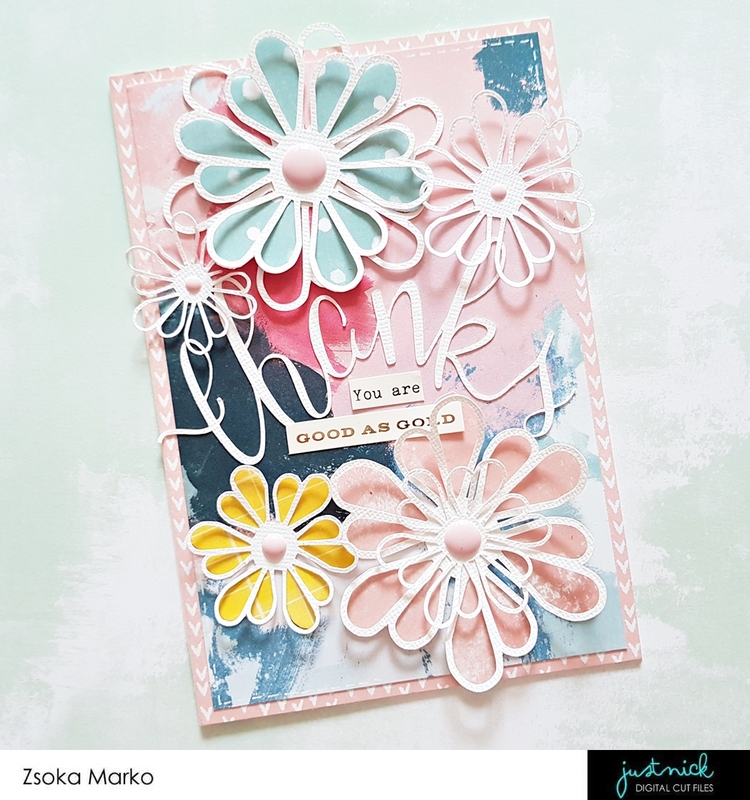 To finish off this card I attached a rubber piece from the AE DD kit. So that I cover all sizes of page protectors in the December Daily album, I also created one in 2x2" size. This format is another favorite of mine, I just love everything tiny! What I did here, you should not follow haha! I thought I'd be clever and design my page already in the Studio program, as in, I took apart the cut file into 2x2" squares and cut them already prepared for me. Same with the backing. The reason I did this is because my trimmer is not exactly reliable when it comes to straight lines! Or several layers of papers. So I ended up spending hours on this simple design, trying to piece everything back together. Of course I lost some pieces along the way! 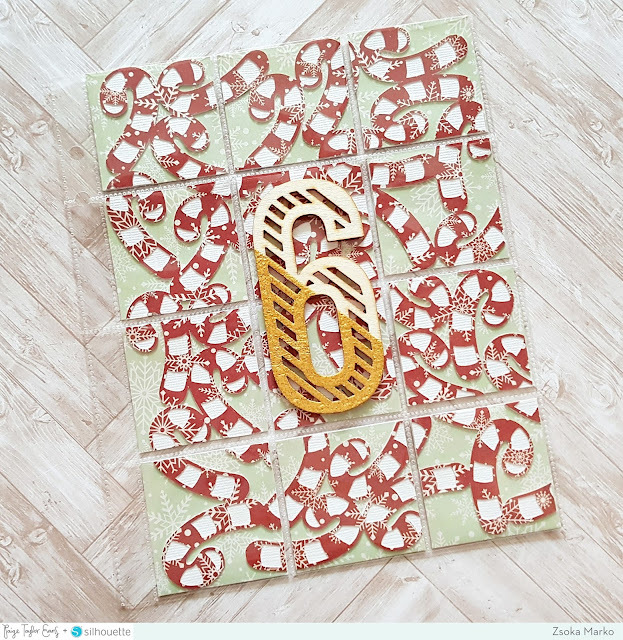 So I suggest if you do this kind of design, print your cut file in 6x8", back it, adhere it to your 6x8" paper and only then cut it into 2x2". Just a thought! Oh, and this adorable cut file is the Candy Cane Background (ID #229108). The papers are from the MME Comfort & Joy collection. 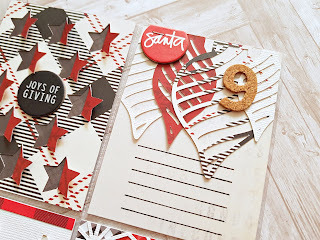 The only embellishment I added (on the page protector itself) is a wood veneer number 6 from Freckled Fawn. 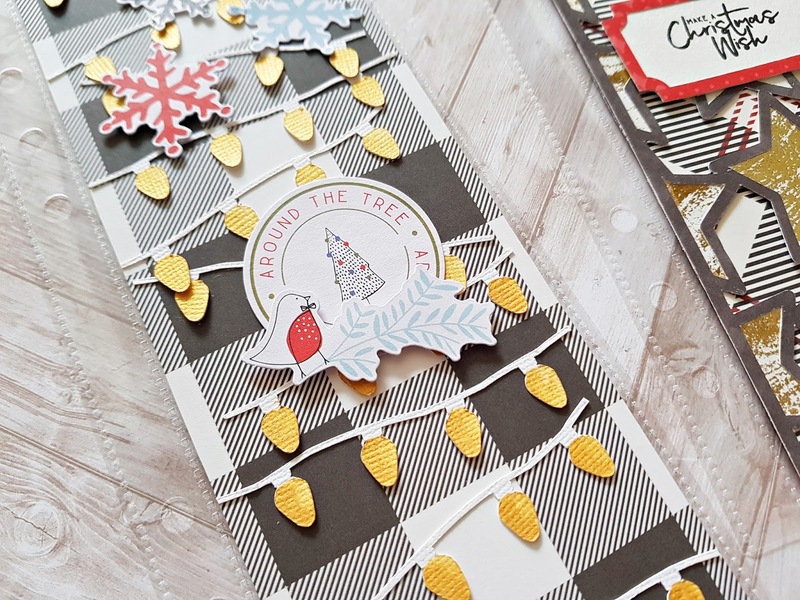 I partially embossed it with gold embossing powder, just to make it a bit more festive! Alright, that's it guys! I told you it was going to be a long post, phewww. 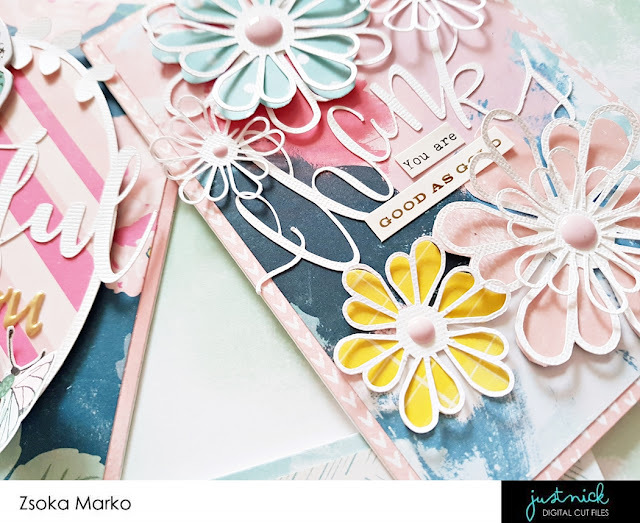 I hope you like these pages and are inspired by one or two!